Since the origin of mankind, storytelling has been at the heart of human existence. From the very first carvings on the walls of caves to our online blogs and ‘tweets’ of today – we are, and always have been, storytellers. It is through stories that we communicate, learn, and associate with one another. Stories are containers of all sorts of narratives with many different layers that need to be deciphered and understood. Artwork in particular is complex, often with deeper messages, so our understanding of a piece of work should not be limited to the narrative shown on the canvas. 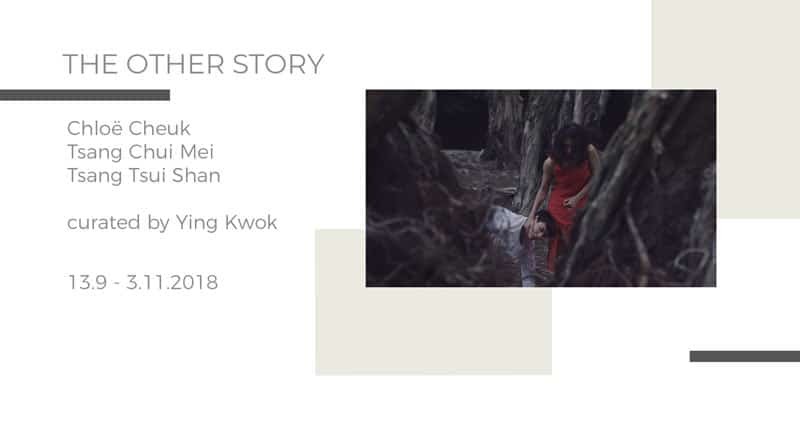 Curated by Ying Kwok, ‘The Other Story’ invites the audience to shift their focus to the non-fictional aspects of an artwork. The artists invited to take part in this exhibition have dedicated themselves to pushing boundaries of their material and medium. They invite focus on the making of the works, instead of the subject matter or theme presented, and sense the interaction between the artists and their chosen medium and materials. Tsang Chui Mei combines vigorous and textured brush strokes with delicate elements to create imaginative scenes. Vibrant colours, overlapping lines, perspectives and considered compositions constitute a tour de force capable of projecting emotions. Tsang Tsui Shan has directed films of various styles and themes with love being an indispensable core element. The chosen work for this exhibition is her first dance video work, which explores the destructive relationship between men and women and the condition of personal internal renewal, through the interaction, conflict and tension of two human bodies. Chloë Cheuk’s practice is motivated by ‘raw feelings’ and her desire to make her work to carry it. For this exhibition, Cheuk is creating new works to examine and depict a state of entrapment in our own body and mind, repeatedly contemplating and ruminating a sense of being caught within ourselves, even if we thought we were reaching out. Based in Hong Kong and working internationally, Ying Kwok has curated ‘Collector Club’ in Oi, Hong Kong, co-curated ‘From Longing to Belonging’ at Laznia Centre for Contemporary Art in Poland, ‘No Cause for Alarm’ at La MaMa Galleria in New York. Kwok was also lead curator of the ‘LOOK International Photography Festival’ 2017, and curator for Samson Young: ‘Songs for Disaster Relief’ as the Hong Kong presentation for the 57th Venice Biennale. From 2006-2012, Kwok was the curator at the Chinese Arts Centre (renamed as Centre for Chinese Contemporary Art in 2013) in Manchester, UK. She was awarded the Asian Cultural Council Fellowship in 2014. To encourage critical thinking and initiating effective discussions in Hong Kong, she founded Art Appraisal Club with a group of local art professionals. The group provides regular exhibition reviews and their articles are published in magazines, various cultural networks and their own bilingual journal, Art Review Hong Kong. Tsang Chui Mei was born in 1972, she obtained her Bachelor and Master degree in Fine Arts from the department of Fine Arts at the Chinese University of Hong Kong in 1996 and 2004 respectively. She was selected to participate a 3-month residency program of Cité Internationale des Arts (Paris, France) in 2015. She often employs colour patches and lines, the very basic elements of painting, in her acrylic works. In coordination with her balanced use of negative and positive space, contrast and generous colours, she presents to spectators an ambiguous spiritual and virtual space. Her recent exhibitions include: ‘Some Landscapes’ at Grotto Fine Art Ltd, Hong Kong), ‘[Purple]: Women of Mankind’ at One East Asia, Singapore. Art works are being collected by the Hong Kong Museum of Art, Fringe Club, Philippe Charriol Foundation, Hotel ICON, Hotel Stage and private collectors.